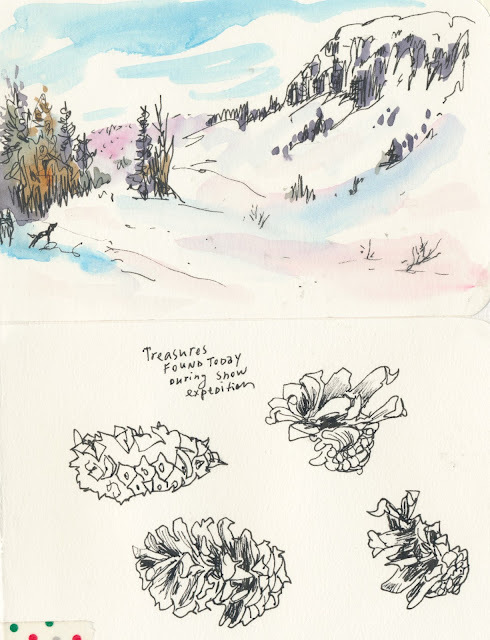 [by Nina Khashchina in Sierra Nevada, California] This year, thanks to El Niño, California finally had some decent snowfall in the Sierra Nevada mountains, which means I went downhill skiing several times and had a chance to sketch while there. For those who live and sketch with the snow in their yearly weather rotation, it's obvious - but for warm-climate dwellers there are some critical changes to the equipment you can use. - My sketch kit becomes super minimal and I try to make sure that I can not only hold it with one hand but stow away quickly with one (possibly very stiff because it's frozen) hand. - Alcohol in my waterbrush. - Fingerless gloves (plus warm mittens in between sketching). - Smaller surface to paint. 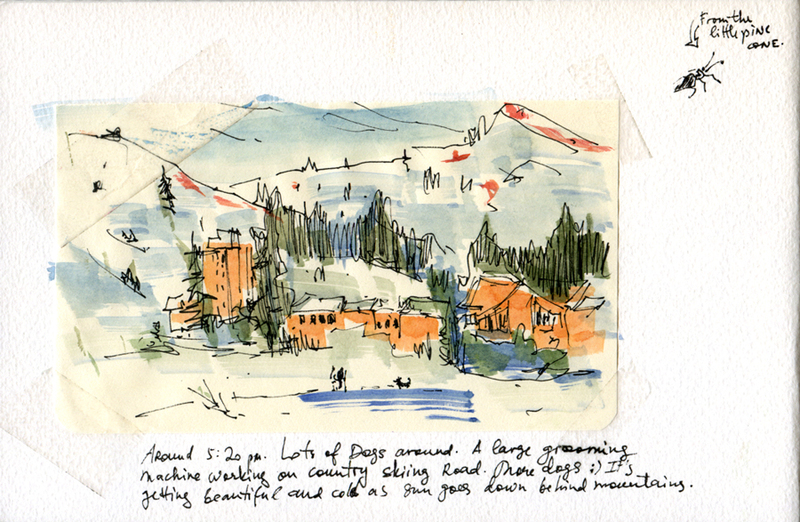 When I paint on my skiing vacation, I usually have two occasions: while skiing (on the lift mostly - but when my kid was smaller and needed more time to go downhill I would sketch even between series of turns - but those days are gone). 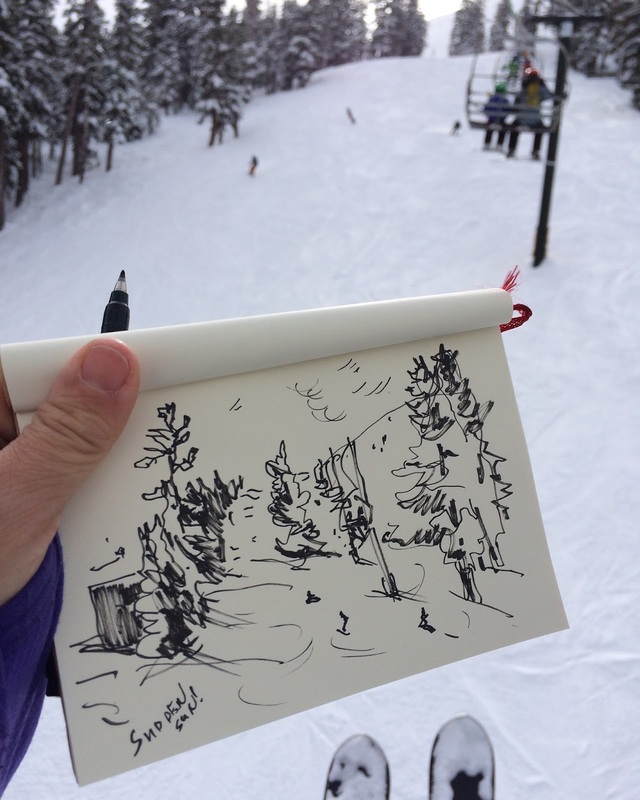 And now I mostly sketch while on the chairlift. 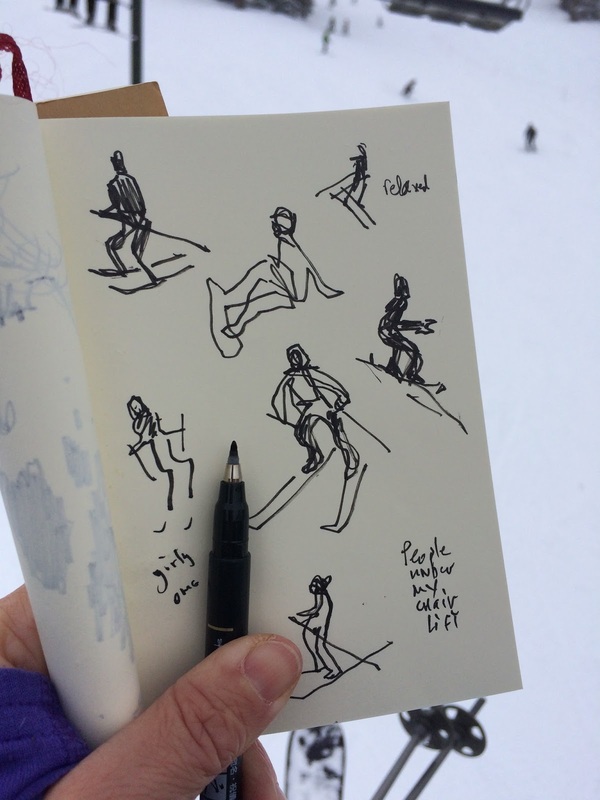 My subjects are people on a chair in front of me, shadows on the snow, tracks on the snow, majestic mountains and skies and skiers/snowboarders on the slopes below me. 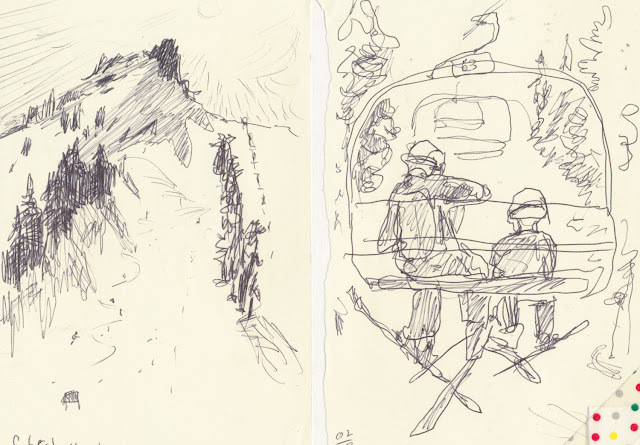 Because the chair is moving I often combine all these things in one sketch and sometimes finish it in a couple of rides. It ties with my interest of sketching same things often - this is how I notice more, see changes clearer and understand patterns better. On the chairlift I use minimum of tools: pen or brush pen or pencil and notebook. That's all. Ballpoint pens freeze often and this year the main tool was Tombow Fudenosuke brush pen. After my day of skiing is over I often go on some snow adventures - to see the mountains, check out dogs and kids playing in the snow, pay my respect to bare trees surviving this weather, look for signs of life in the white world and just move slowly and listen to the sounds of a snowy landscape. This is when I get to paint with watercolors. 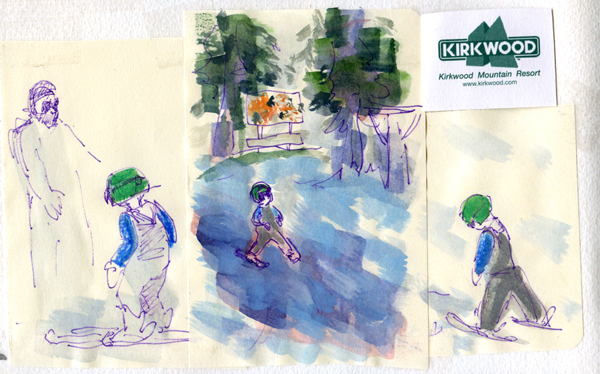 This year I used super-small pocket watercolor palette from Expeditionary Arts, small Stillman & Birn sketchbook and waterbrush. Nina Khashchina lives in Palo Alto, California. You can see all her sketches from her ski trips here.